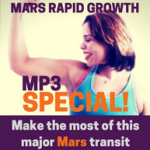 Major Mars Cycle is Here! In April’s forecasts I shared how Mars would be undergoing a lot of intensity until November, and wham, the intensified awareness and growth program of this Mars cycle is here! Everyone has Mars in their astrology, and this yang part of ourselves is now locked into six powerful personal growth months that might at times feel like being king-hit in a boxing ring. All going well, a new more-on-track you will emerge later in the year, but a lot of focused effort is needed between now and then. It’s not a sit back and coast transit by any means. Your astrology will show where the work is needed so you can grab onto this Mars intensive to prepare for your success, rather than feel knocked about unwittingly. At the start of May NASA launched a Mars lander that will touch down on Mars in November, the very same intensified months as the astrology! While a lander takes the journey to Mars, we ourselves have personal Mars makeover journeys for a November revival. Since 13 May, Mars is now in a pre-Retro Shadow, leading up to being retrograde from late June to August, then in a post-Retro until mid-October before entering a new zodiac sign in November. May’s major astrology news is that on the 16th, Uranus shifted into Taurus. For the past eight years, Uranus has been in Aries, but now begins a whole new almost-decade in Taurus. Get ready for a major makeover in the area of your life that Uranus in Taurus affects, whether it’s finances, career, travel, relationships, housing, family etc. Everyone has got a Taurus sector in their personal astro, whether or not you have any planets in Taurus. Let’s say you know your whole chart, and it goes something like this… Moon in Gemini, Sun in Cancer, Mercury in Cancer, Venus in Leo, Mars in Scorpio and so on… i.e. there is nothing in Taurus, no planet, no Sun, no Moon… but even so, your personal birth chart will, no matter what, have a Taurus-zone, essentially what is known as a Taurus house, and Uranus will now be revolutionising that part of your life, whether it’s love, money, work, home, health, holidays, children etc. Uranus is all about revolution and technology. Taurus is an earth sign. It’s to do with homes, the body, possessions and assets. It’s to do with finances, banks, money and what we value. Expect some big changes in banking and finance. Will money as we know it change forever? And what about bodies? There seems to be a trend for bodies to look more and more like mannequins or Barbie/Ken dolls. Will natural bodies make a comeback? I hope so! How’s Your Brain These Days? Uranus in Taurus is a values revolution. Do you remember what your values were before the past eight years of the Uranus in Aries time, the Smart technology era? Uranus in Aries amped up competition and survival, and much of what we now see in the media is to do with winners or losers. It’s virtually impossible to turn on the TV without strobe lights and loud voices charging up adrenalin and the brain, activating winner-loser-survivor zones. How hard are you having to work to pay the rent or pay the mortgage, then come home and rest on the couch and fall into the same old relaxation pattern… either switched into Smart TV or with head buried in a Smart device? 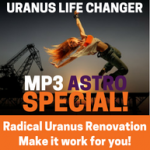 Uranus in Taurus will help us reclaim harmony, relaxation and revitalisation through a values revolution. The Uranus in Aries past 8 years now have us mistaking our tastes for our identities, bypassing actual values. Values are connected to our identities, to our Selves, whereas tastes are more superficial and change with fads and fashions. If you hear someone say, ‘I don’t like tea, I only drink coffee, and there’s no way I’d ever drink a cappuccino, that is just so not me! I’m an espresso person’, is that to do with tastes or values? If the latest trends are that someone is a loser because they like tea and not coffee and this has been hardwired in through a month’s worth of strobe lights through a popular nightly TV show, we might blank out a person because their tastes are different, when in actual fact, their values might be in deep resonance with our own and they might even be life’s most compatible person with us, now no longer seen by us. Fortunately Chiron is now in Aries helping us detox from this. Chiron was part-man, part-horse and represents true uniqueness and diversity, where it’s okay to be a bit of mix and match and not be forced into a predominant version of Self. Chiron stays in Aries until 2026, helping get true diversity back into individual experiences of Self. Anything that’s a core passion is both relaxing and revitalising simultaneously, an immense joy even with effort involved. Working in collaboration with others who have like-values; co-relating and co-creating, reviving an organic lifestyle in health and harmony with nature – this is Uranus in Taurus. Yet Uranus in Taurus could actually make things worse; for example, brains trapped more deeply into simulated versions of mass-produced life experiences through reality TV. Imagine a world where bodies get genuine nutrition, hearts get genuine love, growing food gets genuine fertilisers, and on it goes. Let’s not let things get so bad that even though our favourite biscuits still look and taste the same, overnight the main ingredients become genetically modified pesticide-heavy flours and sugars that only mannequins or Barbie/Ken dolls can thrive on. With Uranus changing zodiac signs we can now use technology to support conscious banking, conscious shopping, conscious investments etc to live more fully, even if we have to keep researching and changing to fit with our values. Between now and November, Mars shows where personal energy is going into old depletions. Instead, grab these perfect months to get your energy back, find clarity on your passionate direction and replenish strong life-force, no matter whether you’re nineteen or ninety! — Free e-news Sign Up notifying of forecasts, go here. Go here on 8 May for the 3rd Qtr Moon forecast, which stays online until the next 3rd Quarter Moon four weeks later. The effect lasts a week until the New Moon, and on a core level lasts the whole month until the next 3rd Qtr Moon. Go here on 15 May for the New Moon forecast, which stays online until the next New Moon four weeks later. The effect lasts a week until the 1st Quarter Moon, and on a core level lasts the whole month until the next New Moon. Go here on 22 May for the 1st Qtr Moon forecast, which stays online until the next 1st Quarter Moon four weeks later. The effect lasts a week until the Full Moon, and on a core level lasts the whole month until the next 1st Qtr Moon. Go here on 30 May for the Full Moon forecast, which stays online until the next Full Moon four weeks later. The effect lasts a week until the 3rd Qtr Moon, and on a core level lasts the whole month until the next Full Moon.